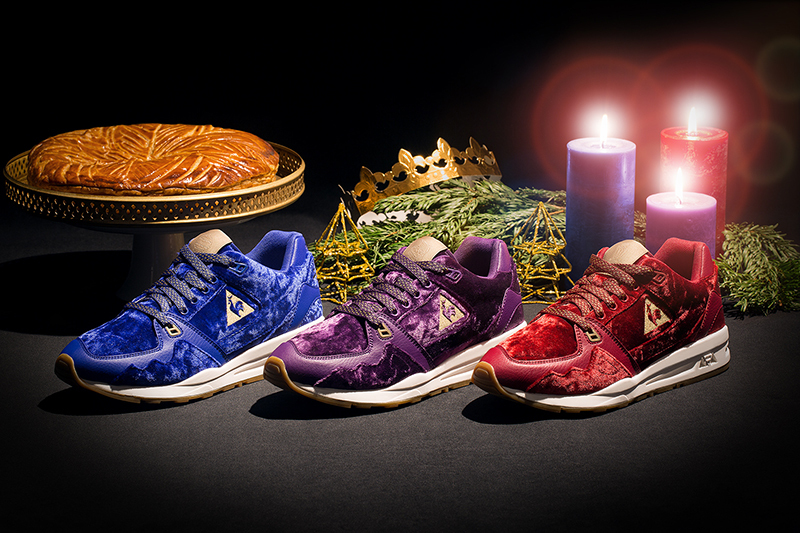 Le Coq Sportif R1000 "Rois Mages"
For epiphany, Le Coq Sportif is redesigning its LCS R 1000 by taking inspiration from the Three Kings. In fact, in the night of 6 January, Three Kings – Melchior, Balthazar and Gaspar – each offer a gift to the new- born child, of gold, frankincense and myrrh. Crafted with authentic materials, the model features three different shades of velvet, in reference to the majestic outfits of these three kings: cobalt blue, Phoenician purple and Rio red. The laces are the same color as the shoe, with golden flecks. The logo and tongues are also in gold to represent these sumptuous kings. The tongue features embroidery in golden thread of the different gifts; they are also printed on the insoles of the shoes. Releasing January 6 at selected retailers such as hanon. New Balance "The 9 pack"